Nerima-ku, "Training Horses ward" is a special ward in Tokyo. The ward refers to itself as Nerima City. As of 1 May 2016, the ward has an estimated population of 721,858, with 323,296 households and a population density of 15,013 persons per km². 121.6% of the ward's population is over the age of 65. The total area is 48.08 km². 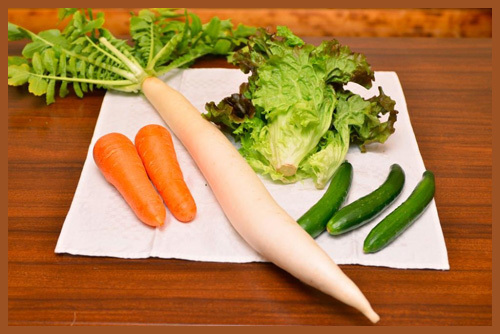 In the Edo period, the area was mostly farmland producing vegetables like daikon radishes, gobo burdocks, and potatoes. 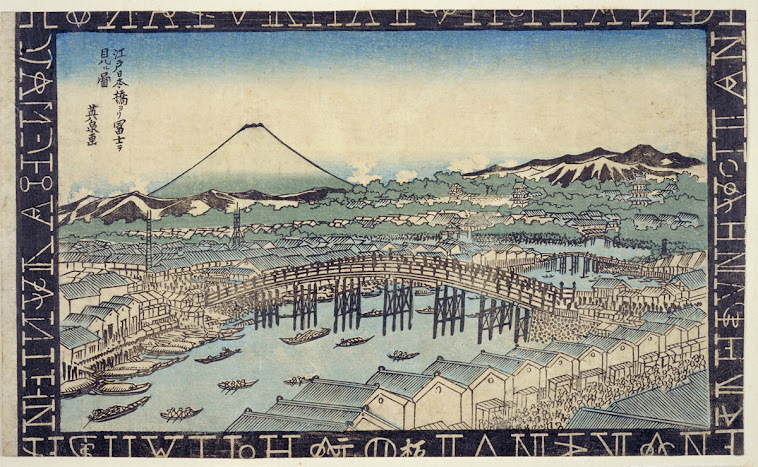 After the 1923 Great Kantō earthquake, many people from central Tokyo moved to the area. ..... Before Tokugawa Ieyasu, there was Ōta Dōkan. 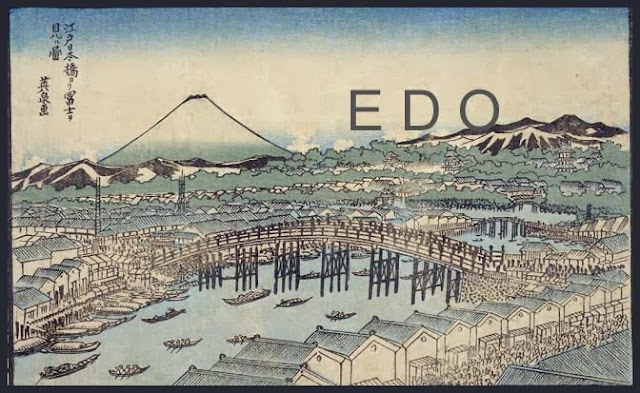 Before him there was the Toshima-shi 豊島氏 Toshima Clan and the Edo Clan. - One of the oldest stories, documented from the Kamakura Period says that sometime between 700 and 800, there was a road connecting 武蔵国 Mushashi no Kuni Musashi Provice and 下総国 Shimōsa no kuni Shimōsa Province. On that road the Toshima clan had a shukueki 宿駅 a horse relay station. The name of the relay town was Norinuma, 乗沼 ride-swamp”. This etymology claims that because the area was a wetland it had many lakes and, well, you could refresh your horses there, too. The local accent changed “Norinuma” to “Nerima” and eventually the kanji was changed to ateji. - Another theory says vassals of the Toshima family were training horses here. This is the most believable story, though it isn’t attested as early as the previous theory. So the name “training horses” is literal. - Another literal theory says some dude was stealing horses and keeping them here and then training them for resale. This kind of etymology, while entertaining, is unlikely IMO. - Another clay theory uses an alternate meaning of the kanji 練 neri. The kanji can also mean “knead” as in “knead bread” or “knead clay.” Supposedly there was an abundance of great clay for pottery making and the place was famous for kneading clay. This etymology says the name was originally Neriba 練場 Kneading Place. There are many examples of diachronic changes and dialect variants where ば ba becomes ま ma (and vice-versa). So linguistically speaking, it’s not impossible. On the site of the former Nerima Village (present day 貫井 Nukui), archaeologists discovered a type of kiln which was rare in the Edo-Tōkyō area. - Another clay theory claims that the dirt and clay in the area was sticky as if it had been kneaded professionally. Thus the area was called Neriba, 練場 just as in the theory I just mentioned. Over time the pronunciation changed from Neriba to Nerima. The clay hypotheses are intriguing. The Shakujii Basin lowlands were an expanse of lakes and swamps and so if you looked at water filled rice-paddies they looked really deep, as in “deep to the roots.” 根 ne root + 沼 numa swamp, marsh = Ne no numa 根の沼 root deep swamp, which changed to 根沼 Nenuma root swamp. Eventually Nenuma changed to Nerima and the kanji was changed to ateji.
. Hayamiya 早宮 Hayamiya district .
. Hikarigaoka 光が丘 / 光ヶ丘 Hikarigaoka district .
. Shakujii Kōen 石神井公園 Shakujii River Park .
. Nerima daikon 練馬大根 radish from Nerima . When Kobo Daishi Kukai visited the area, the villagers were suffering from a severe water shortage. So he slapped is walking staff into the ground and thus water begun gushing out of the new well. There was also a swamp, 貫井の沼 Nukui no Numa and a river, 貫井川 Nukuigawa. 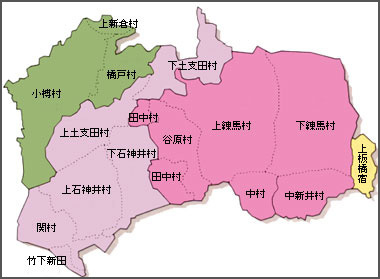 Now there are various sub-districts, 本貫井・東貫井・西貫井・南貫井・北貫井・向貫井・中貫井. The people from 貫井町 Nukui say, at a home where hitodama 人魂 a supernatural fire ball has fallen down, there will soon a child be born. a legendary 8-headed and 8-tailed Japanese dragon. In the compound of the shrine 白山神社 Hakusan Jinja there were two zelkova trees. One of them showed a kind of kaika 怪火 ghost fire on the 25th day of the 12th month in the 12th year of the Showa period. The other zelkova tree has a huge serpent around its trunk in the summer of 1929.
. hikeshi 火消 firefighters, firemen in Edo . At 石神井の池 the pond in Shakuji Park there lived a strange fish, each of its scales looked like a torii 鳥居 gate of a Shinto shrine. During flooding this fish is swept out to the surrounding rice and vegetable fields. The villagers revere it as a messenger of the deity of Shajuji Shrine and never catch it.
. 石神井神社 Shrine Shakuji Jinja .
. ubugami 産神 "deity of one's birthplace" . If a woman was born in 池袋村 Ikebukuro village (former Nerima district) and is disrespectful to the deity of her birthplace, her home would be punished with disaster and misfortune. Therefore most women of this district looked for a wedding partner here and never ventured out.
. Bon Festival お盆 O-Bon, Obon .